The development of big data challenges the computing power and communication capability of cloud architecture, but traditional resource-allocation algorithms perform poorly due to the large-scale communication among cloud nodes. 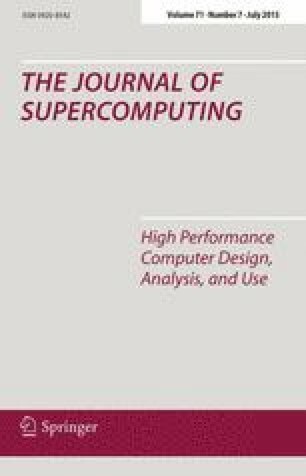 In this paper, a dynamically hierarchical, resource-allocation algorithm is proposed for multiple cloud nodes collaborating in big data environment. Using fuzzy pattern recognition, the algorithm dynamically divides tasks and nodes into different levels based on computing power and storage factors. Thus a dynamically adjusted mapping is generated between tasks and nodes. When a new task arrives, only the nodes corresponding to the task level join in the bid. The algorithm takes advantages of dynamical hierarchy to reduce the communication traffic during resource allocation. Both theoretical and experimental results illustrate that the proposed algorithm outperforms the MinMin algorithm in terms of communication traffic and makespan. This research was supported by the National Natural Science Foundation of China (Grant No. 61173160), Intel Industrial Liaison and Comprehensive Reform Program of Intel Semiconductor (US) LLC in 2014 of Ministry of Education of the People’s Republic of China. We would like to thank the anonymous reviewers for their attentive reading and for their constructive comments that have helped to further strengthen this paper.